M.F. Smith photo,courtesy Branford Hist. Soc. The Shore Line Trolley Museum operates a portion of the old "F" trolley route of the Connecticut Company, which provided service from downtown New Haven, through East Haven and into Branford. From 1907 until 1937, the line was extended through Pine Orchard to Stony Creek. Passenger service on the line began July 31, 1900 and was discontinued on March 8, 1947. The museum immediately assumed operation of the line, making this the oldest continuously operating suburban trolley line in the United States. This distinction led to recognition of the museum's line and collection on the National Register of Historic Places. 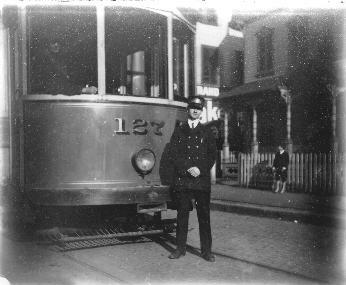 The trolley line was constructed by the Branford Light and Water Company and was backed mostly by local interests. The coming of the trolley in 1900 to the sleepy town of Branford changed life there forever, and heralded Branford's entrance into the modern era. It was an extension of a trolley line that had come six years earlier to the neighboring town of East Haven. For nearly five decades, the trolley provided clean, fast, affordable, reliable public transportation. One would take the trolley to shop for groceries, go to work or school, or go out on the town for the evening. The trolley created the suburbs, making it possible to live far away from urban centers of employment and yet commute easily and affordably. Yet the suburban community which the trolley helped create would eventually contribute to its downfall. Towns, such as Branford and East Haven, soon sprawled away from the linear path of the trolley as the the private automobile came into the realm of common folk. The convenience of being able to go where and when one wanted to go was a powerful intoxicant. That, combined with drastically increased labor and materials costs associated with maintaining and operating a trolley line, damage from hurricanes in the 1930s, and the political pressure to avoid raising the nickel fare, spelled the gradual end of trolley service from 1936 through 1947. Although bus service was substituted, never again would street-running public transportation be so centrally linked to daily living. Thankfully there is a place where this wonderful period of our history is kept alive. The Shore Line Trolley Museum continues to operate a fine collection of restored trolleys over a 1.5 mile segment of the Branford Electric Railway, a portion of the line running via private right-of-way from East Haven, through the woods and marshland of Beacon Hill to Short Beach. Removed from modern-day distractions and traffic jams, the scene seems nearly unchanged by the passage of a century. Would you like to learn more about the history of the Branford Electric Railway? The following four-part article originally appeared in the museum's newsletter on the occasion of the line's Centennial. This material is copyright © 1997-2011 Branford Electric Railway Assoc. All rights reserved.